I thought it might be interesting to some of you to learn what hardware and software I regularly use as it changes over time. It might help you understand my big picture. Periodically I will post a gear report detailing what I’m currently using and why. This one is, again, a bit overdue and there are a number of changes. Ultimately, what I strive for is ease of use so daily activities are less of a hassle. I also try to keep things green by using lower power products where I can. While they might not all be the easiest to setup, it generally ends up easy to use, and I like that. To that end, I’ll get started. At the desktop I use an Apple Mac. I switched from PC back in 2001 and never looked back. I truly have never been happier with hardware reliability, system configuration, and overall ease of use. 1920 x 1200 resolution (16:10 ratio). 16:9 (1920×1080) is for movies, this is a computer and the extra pixel height is valuable real estate. Used to share the keyboard, mouse, monitor, and speakers between computers. I replaced the iPad Air with this. I recently integrated a hi-fi amp into my desktop setup. I’m using a 35 year old Pioneer SA-520 (32 watts per channel) amp to drive two Polk Audio M10 5.25″ 2 way shelf speakers. Yes, the amp is big, but it sounds good. Because I use Apple hardware, I use Mac software. Here is the rundown. Operating System: Mac OSX 10.10.4. A mediocre release. 10.8 was the pinacle of design and my favorite release. 10.9 retained much of 10.8’s charm, but started losing just a bit. 10.10.4 is a continuation of the Google-ish whitewash with hard to deliniate buttons, not enough shadows, and an ugly font. There are still a lot of useful features, but visually things are hard to pick out. Password Management: 1Password. Hands down the best password manager around. Photo Management / Touchup: Apple killed off Aperture with the release of Photos. I tried Photos and don’t care for it. I moved to Adobe Lightroom 5 after trying several photo management tools. Movie Editing: iMovie. iPhoto for movies. Enough said. Music Management: iTunes 12. I am becoming more disappointed with iTunes as it matures, but it is required to effectively keep things in sync on my iPhone and I’m accustomed to using it so why switch to anything else. Reminders Management: Reminders (part of OS X). I’ve started using this extensively as part of my GTD (getting things done) methodology. Contrary to what you might read, it can be used for GTD effectively. Small notes: Notes (part of OSX) Since 10.8 its a standalone app rather than being embedded in Mail. Yay! Code Editing: Atom Editor. Easy to use, fast, extensable,and cross platform to boot. Best editor I’ve used since Crimson Editor on the PC. Office Suite: Microsoft Office 2011. Though I have started using Apple Pages and Apple Numbers more and more. Migration to the Apple apps continues, though I still do a few things in Microsoft Office. The integration with iCloud and ability to easily edit a document on any of my Apple devices is a huge plus. AirPrint support via Printopia. Works great, the only downside is the computer its running on must be awake and logged in. I use a server to run virtual machines where I learn new software and experiment with new technologies. I have it running Citrix XEN Server as the virtual machine host. It can run many virtual machines at once which I can remotely connect to from other computers on the network. I only power this up when I use it. I use several wireless routers. This helps distribute the wireless load when multiple wireless devices are communicating (like streaming video or music). Each wireless router uses a different SSID (network name). Each wireless device is homed to a specific router (via SSID) and does not interact with the other routers. Each router is separated by at least 5 channels within the bandwidth spectrum to mitigate interference. You’ll notice they are all ASUS. I stuck with these because they have been virtually bullet-proof. Dual Band router set to provide 802.11ac and n access only via 2.4Ghz and 5.8 Ghz bands. No b/g devices on my network. Provides a guest wireless network which can only communicate to the internet. Since I do not know how guests manage the security of their devices I partition them off the main home network. There is no way to infect my devices if they have a virus. The guest network also allows bandwidth provisioning. Guests get last dibs on bandwidth (and its capped) when on the guest network, so they should hope nothing else is busy. (2) Western Digital 1 TB 5400rpm “green” hard drives in RAID 0 (mirrored) format. Any write is done to both drives so they are the same. If one dies, the other will have the data. The drives are both Western Digital, though my drive preference is Seagate. I use this as primary backup for pictures, home movies, applications, and personal data (documents, spreadsheets, etc). Since its not used all the time, it hibernates in a very low power mode with discs and fans off. It also runs MySQL, Apache, and PHP. I have it hosting a vehicle maintenance database that I wrote in PHP. Used a local cloud drive. It always available because it’s plugged into a router and it doesn’t go to sleep. I have all computers making a connection to it at login. I chose this printer after several HP printers failed in a short period of time requiring replacements. It has turned out to be very reliable and produces excellent quality printing. Though the ink cartridges are cheaper than the HP ones I was buying it seems like one of the 6 is always running low. As of now (12/2014) I’m really tired of always having a low or empty ink well. In 2015 a multi function laser printer will replace it. After careful analysis I found it is cheaper to keep feeding the Canon MG6120 ink rather than replace it with a laser. My analysis was done using manufacture stated sheet yields. The ink won out by a mere 1.5c per sheet. Maybe there is convenience I will have to factor in at some point. I’m also starting to wish it had AirPrint built in. Because it is network attached it can be printed to from any computer or laptop on the network (anywhere in the house). Similarly the scanner can be accessed the same way. I have a few devices used for entertainment. The aging Wii which is pretty much dead to me thanks to the XBox superior graphics and performance. The aforementioned XBox, and Dell Zino HD are also part of the lineup. The Zino is an HTPC (home theatre PC) that I leave running Windows Media Center all the time. I’ve tried several DVR applications, but this one is simply the best. Replaced the Apple TV version 3. Integration with Prime makes watching it easy, and apps for Netflix and Hulu make those easy as well. With the PLEX app on the Fire TV and a PLEX server running on the Dell Zino HD (and the Zino having my media mounted from the Sinology NAS) I now have full access to all of my photos, movies and music – something I couldn’t do with the Apple TV. I actually like the Fire TV interface better too. The Wii started locking up, so I hesitantly replaced it with a Wii-U. It was a good opportunity to prune out some games as well. Not completely happy with this as it often logs out of Netflix for no reason, but disc playback is excellent. Apple iPhone 6. Finally updated to newer phone. Very comfortable, good quality, good run time on single charge. Tracking daily activity and calorie intake. Tracking body weight and BMI. No vampiric power loss. Cuts power once a device is charged. Any port can charge any device and power is scaled to match needs. The most awesome laptop stand I’ve ever seen or used. There are a handful of mobile software applications outside of the ones provided by Apple that I recommend. These are for obviously for iOS. Google Voice – Give quick and easy access to my Google Voice account and provides easy outbound dialing from the Google Voice number. Google Authenticator – Used for Googles two-factor authentication. OneDrive – Used to quickly view and edit documents on Microsoft OneDrive. Formerly SkyDrive. Flickr – Mobile interface to my Flickr account. imdb – Used to lookup movies and actors. GeekBench – Used to test the speed of devices. AnyList – Grocery list management which can be shared with other family members. Mobile-Pocket – Scanable interface for all those store loyalty cards. I replaced CardStar with this one as this one is much faster and has no ads. OneNote – Large notes. I like the interface much better than Evernotes. Flickster – Tracking movies I’ve seen, rating, and tagging movies I want to see. iOS Mail – Email. I use this client for 95% of all email. Rarely do I use the desktop version. The Apple iOS Mail app does everything I need and hasn’t caused me any trouble so I stick with it. SlowShutter – Used to take long exposures with iPhone camera. DipTic – Used to make photo collages. Feedly – Reading RSS news feeds. This is where I give you a glimpse into what I am currently investigating or setting up. Off-site backup solution, to backup the backup, in case of disaster. I started this but have not finished. I tried Amazon Glacier using the Synology to feed the data. The vaults are hard to manage, you really can’t browse them and I felt like I had no control, but the monthly price was dirt cheap (less than $1 for my needs). I plan on upgrading the Synology NAS to a newer unit since the newer units can run the DSM 5 software which has the ability to feed data to other sources such as Dropbox and a few others. I am using a third party app on my current Synology NAS to feed some data to one of those services now (as a test). This upgrade will happen by the end of the year, at which point I can finally put this project to rest. DVI based KVMP – This is low priority – and may not happen. I thought it might be interesting to some of you to learn what hardware and software I regularly use as it changes over time. It might help you understand my big picture. Periodically I will post a gear report detailing what I’m currently using and why. This one is a bit overdue and there are a number of changes. Operating System: Mac OSX 10.10.1. A mediocre release. 10.8 was the pinacle of design and my favorite release. 10.9 retained much of 10.8’s charm, but started losing just a bit. 10.10.1 is a Google-ish whitewash with hard to deliniate buttons, not enough shadows, and an ugly font. There are still a lot of useful features, but visually things are hard to pick out. Photo Management / Touchup: Aperture. If you like iPhoto, you’ll love Aperture. Think Adobe Lightroom with iPhoto simplicity. Don’t get too attached though as Apple is killing it in favor of their upcoming Photos application in 2015. Small notes: Notes (part of OSX) Since10.8 its a standalone app rather than being embedded in Mail. Yay! Office Suite: Microsoft Office 2011. Though I have started using Apple Pages and Apple Numbers more and more. Dual Band router set to provide 802.11n access only via 2.4Ghz and 5.8 Ghz bands. No b/g devices on my network. This is not part of the main entertainment system. I’m also more than a little disappointed with it. I can’t stream my own content unless I have a computer turned on and logged in, unless it happens to be purchased content from the Apple App store (which I dont have much of). Apple should embed an iTunes server in the Time Machine devices to eliminate the logged in Mac requirement. Apple iPhone 4S. Yes, stillrockin the4S, withiOS 8.1 even. Off-site backup solution, to backup the backup, in case of disaster. Leaning towards Amazon Glacier and Arq software. Started investigating and hope to have completed by end of Summer 2015. Almost 2 years behind on this. I’ve been reorganizing photo storage and only want to send all the data offsite once via hard drive. Will be a priority in 2015. DVI based KVMP – This is low priority. Amazon Fire TV to replace the Apple TV. Mainly because I watch Prime and it’s a hassle to setup streaming from my phone or iPad everytime. And secondly because Plex is available for it which will allow streaming of my content from a Plex server locally. Plex Server. I have this running on the Zino now, but when it goes to sleep, aplex becomes unavailable. I want to set it up on my old Mac Mini. I thought it might be interesting to some of you to learn what hardware and software I regularly use as it changes over time. It might help you understand my big picture. Periodically I will post a gear report detailing what I’m currently using and why. Operating System: Mac OSX 10.8.2. In my mind one the best releases of OSX to date. There are so many useful features. Photo Management / Touchup: Aperture. If you like iPhoto, you’ll love Aperture. Think Adobe Lightroom with iPhoto simplicity. Small notes: Notes (part of OSX) In 10.8 its a standalone app rather than being embedded in Mail. Yay! I chose this printer after several HP printers failed in a short period of time requiring replacements. It has turned out to be very reliable and produces excellent quality printing. Though the ink cartridges are cheaper than the HP ones I was buying it seems like one of the 6 is always running low. RocketFish RF-MAB2 Bluetooth Headphones. Very comfortable, good quality, good run time on single charge. SkyDrive – Used to quickly view and edit documents on Microsoft SkyDrive. Vimeo – Mobile interface to my Vimeo account. CardStar – Scanable interface for all those store loyalty cards. Off-site backup solution, to backup the backup, in case of disaster. Leaning towards Amazon Glacier and Arq software. Started investigating and hope to have completed by end of Summer 2013. Password Management: 1Password. A long time ago I used a cross platform password manager that used unlimited key length RC4 encryption, that I wrote using RealBasic 3. When I started using a smartphone it changed my requirements and I moved to a product from Acrylic Software called Wallet. It didn’t have a Windows version which was a pain, and after a while the author announced it would no longer be maintained as he went to work for Facebook. After a lot of research I moved to SafeWallet from SBSH for iOS, OSX, and Windows. They recently changed their pricing model and sync strategy. I’m no longer comfortable with the sync strategy so I am currently moving to 1Password from AgileBits for iOS, OSX, and Windows. I’ve been using LastPass to manage web passwords, but I’m moving that to 1Password as well since it can handle that job too. Photo Editing / Management: Aperture. If you like iPhoto, you’ll love Aperture. Think Adobe Lightroom with iPhoto simplicity. I use this server to run virtual machines where I learn new software and experiment with new technologies. I have it running Citrix XEN Server as the virtual machine host. 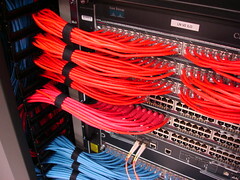 It can run many virtual machines at once which I can remotely connect to from other computers on the network. I only power this up when I use it. Provides a guest wireless network which can only communicate to the internet. Since I do not know how guests manage the security of their devices I partition them off the main home network. There is no way to infect my devices if they have a virus. The guest network also allows bandwidth provisioning. You get last dibs on bandwidth (and its capped) when on the guest network, so hope nothing else is busy. Because it is network attached it can be printed to from any computer or laptop on the network (anywhere in the house). Similarly the scanner can be access the same way. There are a handful of mobile software applications outside of the ones provided by Aple that I recommend. These are for obviously for iOS. SkyDrive – Used to quickly view documents on Microsoft SkyDrive. Off-site backup solution, to backup the backup, in case of disaster. Leaning towards Amazon Glacier and Arq software.